What is a Compatible Pair? Patients with a cPRA <80%. Compatible pairs that do not have the above characteristics may still benefit from participation in swaps but may experience longer wait times depending on their blood type combination and the patient's cPRA. A mother who has a biological child as a donor should always consider paired exchange because the mother may have donor specific antibodies (DSAs) against the child's paternal antigens. These DSAs can negatively impact the transplant outcome. It is nearly impossible to improve upon a sibling donor with a 3-6 antigen match (see chart in the following section) so compatible siblings with a 3-6 antigen match should generally not consider entering a swap unless there is a special consideration. A parent giving to a biological child is always a good HLA match but is sometimes a poor age match depending on the age of the parent. The advantages of participation in swaps for parent to child compatible pairs generally depends on the age of the parent, the older the parent, the greater the advantage of a swap. 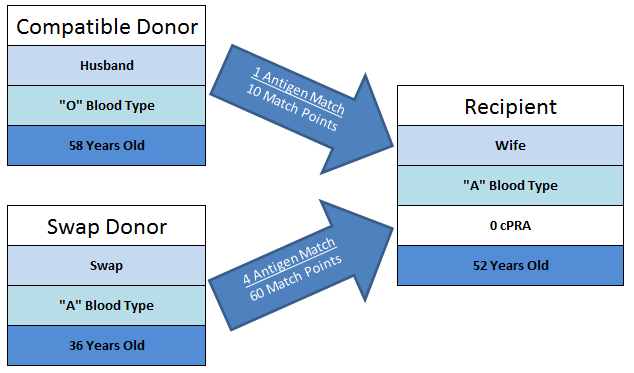 In the example above, the swap donor is 22 years younger than the compatible donor and has 50 additional HLA match points compared to the compatible donor. This translates to an additional 26% mean kidney life years (50 HLA Match Points adds 11%, Donor Age < 55 adds 9%, Donor Age 22 Years Younger adds 6%). 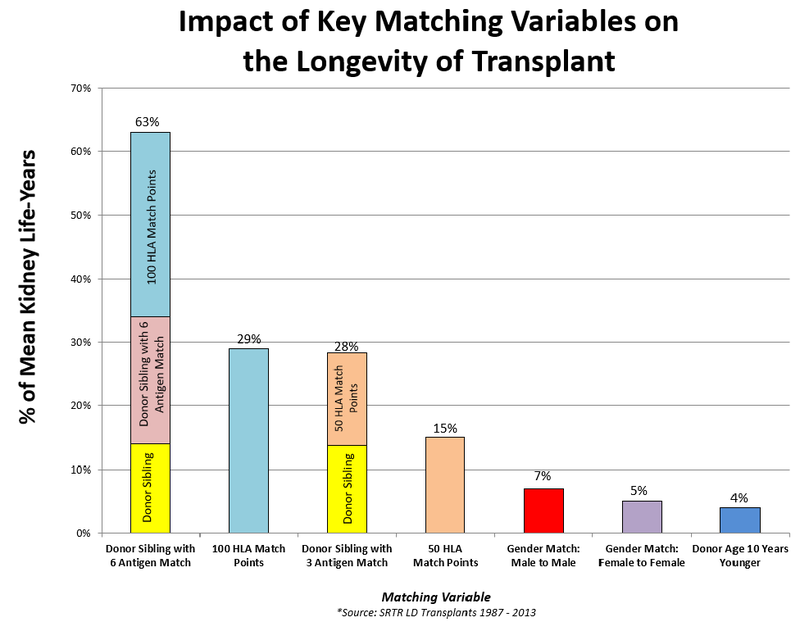 Matching variables and their impact on longevity of transplant are described in the next section. By choosing to participate in an NKR swap, compatible pairs are eligible for the 90-day kidney replacement policy. If the transplanted kidney fails and the issue is reported by the transplant center within 90 days of the transplant the patient may be eligible for prioritization to receive a replacement kidney. Compatible pairs can also benefit from participating in swaps by finding a better matched donor which will increase the chances that the transplanted kidney will function better and last longer. 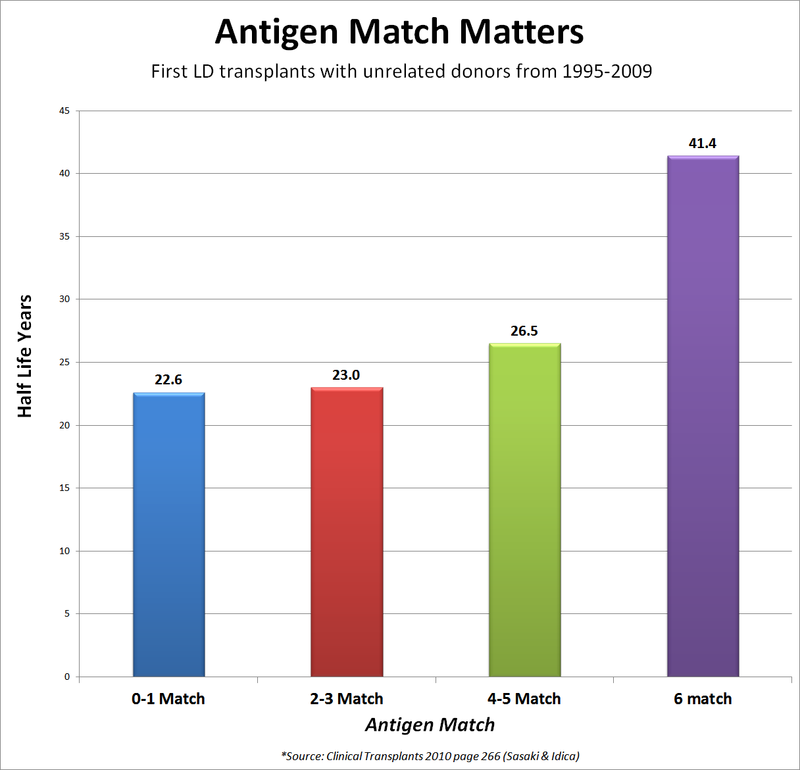 Generally the improvement in the match from a swap is driven by a better HLA match or a younger donor. A better HLA match is also correlated with lower patient mortality over time because a good HLA match will reduce the number of antibodies created from mismatched antigens, and make it easier for patients to be retransplanted in the future. A better donor HLA match is also correlated with lower patient mortality over time because a good HLA match will reduce the number of antibodies created from mismatched antigens, making it easier for patients to be retransplanted, if needed. Another benefit derived when compatible pairs participate in swaps is that other patients with incompatible donors are helped because a compatible pair will generally facilitate between one and ten additional transplants. In other words, compatible pairs facilitate transplants for other incompatible pairs. Compatible pairs with the characteristics listed above can generally expect to wait three weeks from activation in the NKR to the actual surgery date. There are times where a swap may fall apart and in those cases one to three weeks is generally added to the wait time. 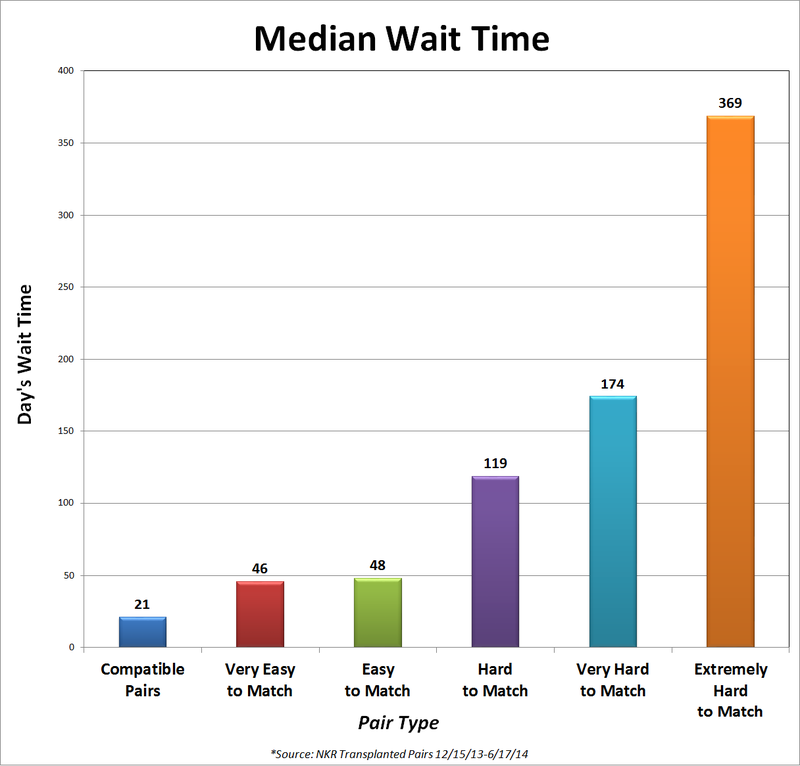 The chart below shows the median NKR wait times for different types of pairs, with compatible pairs being the fastest to go to surgery. Compatible pairs have the characteristics listed above. Very easy to match pairs have a pair match power (PMPc) greater than 125. Easy to match pairs have a pair match power (PMPc) from 31-125 and an A, B or AB blood type patient. Hard to match pairs have a pair match power (PMPc) from 1-30 and an A, B or AB blood type patient. Very Hard to match pairs have a pair match power (PMPc) from 31-125 and an O blood type patient with a non O blood type donor. Extremely hard to match pairs have a pair match power (PMPc) from 1-30 and an O blood type patient with a non O blood type donor. The National Kidney Registry provides compatible pairs the best chance of safely finding a well matched donor which increases graft survival and is correlated with more kidney life years. The National Kidney Registry works with the top transplant hospitals in the United States and has facilitated more exchange transplants than any other exchange program in the world. 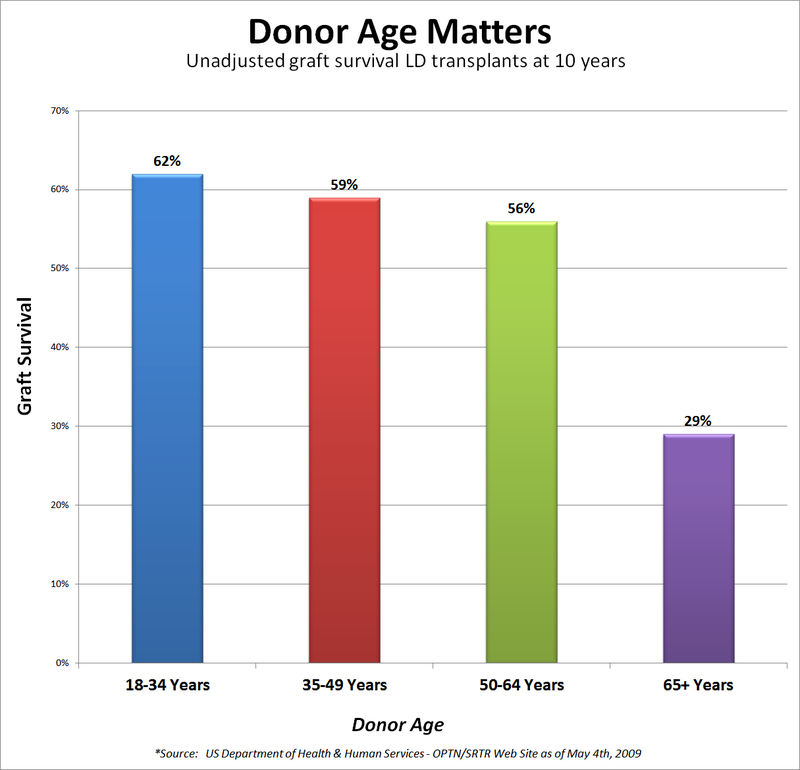 Additionally, the patient outcomes from transplants facilitated by the National Kidney Registry exceed the average U.S. living donor transplant outcomes (see chart below). We believe this is driven by the improved donor - recipient matches available through the National Kidney Registry which is the largest living donor pool in the world. There are some transplant centers that attempt to provide paired exchange services for compatible pairs from a "single center." 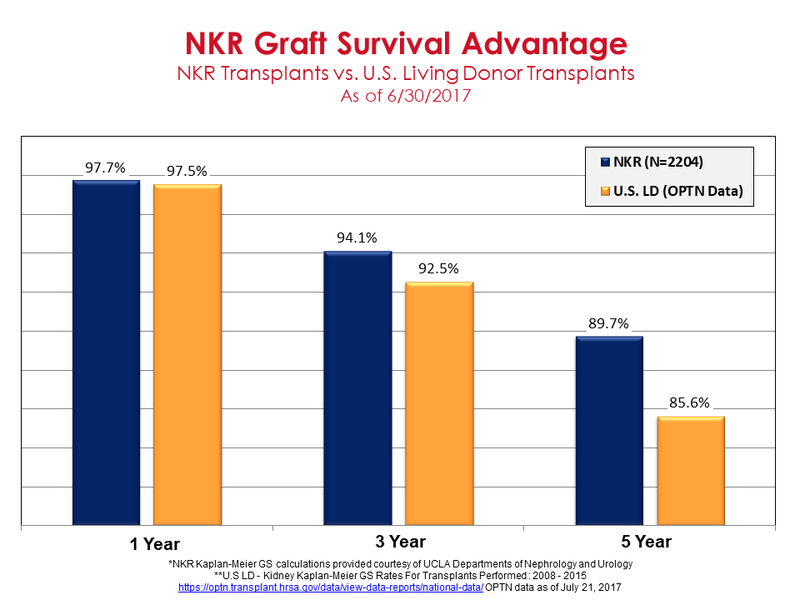 This approach may make the logistics easier (no need to ship kidneys or coordinate surgery dates with other centers) but this "single center" approach cannot equal the NKR's ability to improve HLA and donor age matching which improves transplant outcomes (i.e. the kidney lasts longer). This is because paired exchange is inherently a numbers game and the NKR is the largest paired exchange program in the world and the NKR has, by far, the biggest pool of donors. The larger the pool of donors, the better the matches. Single center programs have limited ability to "repair" a real-time swap failure (e.g. recipient experiences complications during surgery and cannot receive the kidney). If a single center program cannot "repair" a failed swap, the patient, whose paired donor has already donated, is left without a kidney. Single center programs do not have the volume to repair failed swaps quickly. The NKR has successfully repaired many real-time swap failures. The NKR’s solution for resolving real-time swap failures is outlined in our Medical Board Policies. Additionally, paired exchange presents unique challenges related to protecting donors from the financial exposure related to un-covered donor complications. The NKR has a Donor Protection Program which eliminates this exposure. If you are considering enrolling in a single center paired exchange program, you should request a written copy of the center’s 1) policy for repairing failed swaps and 2) policy for protecting donors against un-covered donor complications. If a written copy of these policies are not immediately available or if they are filled with legal language that protects the hospital, you should consider enrolling in the NKR program where these important risks are clearly addressed. Increase the chance of finding a great HLA match which is correlated with more kidney life years. Increase the chance of finding a younger donor which is correlated with more kidney life years. Reduce the risk of a real-time swap failure where the patient could be left without a kidney. Help the most incompatible pairs find a match and get transplanted. Allow the donor to receive donor protections offered through NKR swaps. Give the recipient eligibility to receive a replacement kidney should their transplanted kidney fail within 90 days as a result of the donor surgery.